Traveling outside your local area provides a special opportunity for personal growth. With an open mind and proper planning, a trip can expose you to different histories, cultures, customs, architectures, people, environments, and perspectives all at the same time. I have been fortunate to spend time in several parts of the United States and in over 20 countries. Most recently, I visited Ireland for ten days in April 2011 and took advantage of this opportunity to learn and to grow. Provides tips on enhancing your personal growth from a trip. Summarizes a few of my key takeaways from the trip to Ireland. You will always learn something on a trip without much effort. But you will get more out of your trip and it will be more meaningful if you are open-minded, excited, and eager to learn. Apply these tips for a more personally rewarding experience. 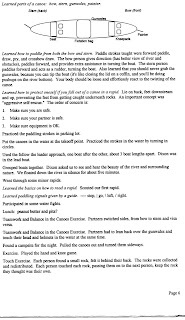 Examples of how I applied these tips for the Ireland trip are noted in italics. Research before you go. You will absorb and experience more during a trip if you become acquainted with the area before you go. Why? Advanced exposure gives you a base level of information to which you can relate your experiences and learnings when you are there. You can more quickly decipher what is meaningful and spend more time exploring what you know is important. And you can minimize the time you spend during the trip on logistics and acquiring basic information. Books, the internet, and people knowledgeable in the area are three resources you can leverage prior to the trip. Libraries and bookstores may have books on the subject you can read or skim through. The internet contains a wealth of information, from Wikipedia and TripAdvisor to Flickr photos and YouTube videos. And knowledgeable people you may be able to tap for information include people you know (friends, friends of friends, colleagues) and people you encounter in social networks and forums. Key topics to become acquainted with prior to a trip include the area’s history, culture, customs, key sites, current events, and traveler essentials (such as currency, voltage, driving rules). Wikipedia to read about the history of Ireland and a description of each of the towns and major sites we were to visit. Google Maps to see where it was on the map and view the landscape (using satellite view). Street View in Google Maps (where available, drag the Orange person symbol to a street) to "virtually" travel the streets in the city centers and near the hotels, getting a taste of what the area looks like. Images view in Google Search to quickly view several photos about the places we were to visit. TripAdvisor to see how people rated the hotels and find which tourist attractions were highly rated. I also checked out a book Eyewitness Travel’s Ireland from my local library and read introductory information on the places we were to visit. I also read a copy of Insight Guides Ireland I received from the tour operator. The trip leader (Connie Ahalt of Brave Spirit Seminars) had been to Ireland several times before and was quite familiar with the country. She held three sessions prior to the trip and provided handouts about Ireland. These included write-ups on history, culture, customs, and reading recommendations. Talk with (but mostly listen to) the locals. The people who live in the area you are visiting are able to give you unique perspectives and insights. Strike up conversations and ask questions. Let them do most of the talking, as the purpose is to learn from them. Talk with many people in different places to get additional perspectives. Consider the culture and customs to know who and where to ask questions and understand how forthcoming they may be with their answers. During a round trip van ride between Botswana and Victoria Falls in Zimbabwe in 2009, I had the luxury of having a one-on-one conversation with the van driver for over two hours. I learned about his beliefs and perspectives on a number of personal and political topics that I would never had gotten otherwise. In Botswana, I had the opportunity to speak with a few expats working in the country on their observations as an outsider living in the country. All of these conversations added insights and knowledge I would have missed if I had not asked questions. For the trip in Ireland, I had a number of opportunities to learn from locals. We had a wonderful guide who provided a wealth of information throughout the trip, and we had subject matter experts at several important sites we visited. All of them were open to questions. Because I was with a group, I learned even more through discussions with my fellow travelers. Even a simple starter question like, “what was your favorite activity today?” gave me additional perspectives on what was meaningful and what others learned during the trip. Learn a few words in the local language. This helps you two ways. First, you learn a few new words in the local language if it is not already familiar to you. Second, it can help you establish a good rapport so you can strike up a conversation with a local. Here are the ten must learn words and phrases I suggest you learn at a minimum. Walk. That is, take the time to explore with your two feet. If you only experience an area through a tourist bus window, taxi, or rental car, you only get a glimpse of real life in the area. Walking allows you to observe the sights and sounds of everyday life, of side streets and residential areas, and of places off the tourist track. Walking lets you take a little more time to experience and absorb. For the trip in Ireland, my girlfriend and I walked more than 50 miles during the 10 days we were there, exploring on foot the side streets in Galway, soaking in the beautiful gardens in the parks of Dublin, and enjoying the trails around the lake in Killarney and through an abandoned abbey. 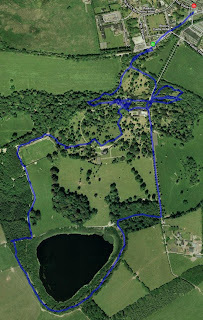 I used the MotionX GPS application on the iPhone to track each of the walks. 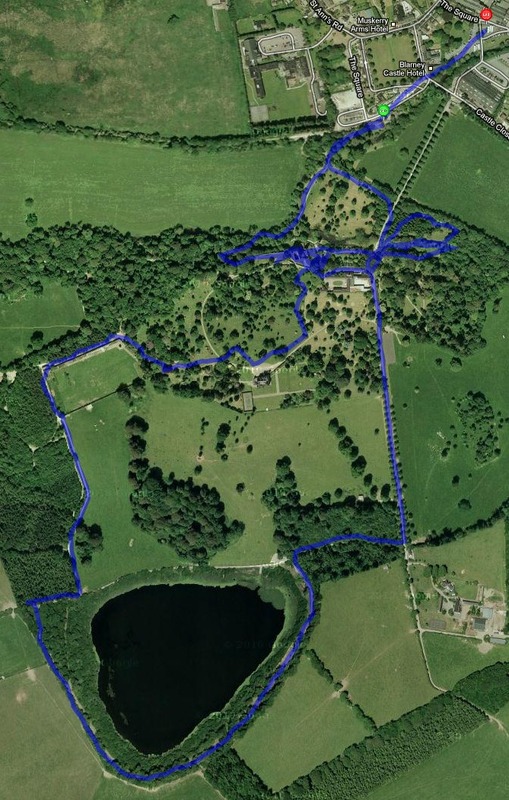 Here is a view of the 3.64 mile walk done at Blarney Castle. Focus on the right things during your trip. Focus on observing and experiencing what is meaningful and new to you. This is easier to do if you have prepared for the trip, as you will have an idea of what to focus on. It is also helpful if you have a good guide or a knowledgeable person to point out and describe what is important. Use all of your senses to help gather in information that is relevant. Some people limit their trip experiences by either focusing on the wrong things or not being open to new experiences. If you begin thinking about how you look, what you want to eat for dinner later that day, what your friends or colleagues are doing back home…you are not focusing on the experiences around you. You are not in the moment. If you tune out of a guide's description about an important topic, you will not gain as much from the trip. I still remember a key learning for me on a trip in Kauai back in 2003. I was in a van reading a book about Waimea Canyon just as we were entering the canyon. The guide looked at me and gave a sharp reprimand: “Get your eyes out of that book and look around you!” I was reading about the beauty around me instead of experiencing the real beauty all around me. It was a good lesson for me. 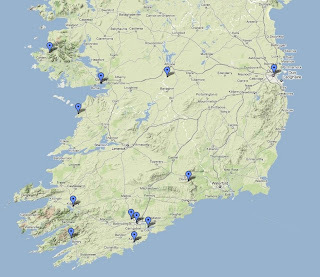 For the trip in Ireland, preparation helped me know what walks to take and what sites to see. The tour itinerary and the guides helped me focus on the right things. I also visited museums and exhibits that highlighted the more important topics of that area and of Ireland. Do not turn on the television. Get out of the hotel room and explore. Capture notes while you are on the trip. Notes will help remind you what you did, what you saw, what you felt, and what you learned. The best approach is to capture the information during breaks or at the end of each day so you will not forget. You can capture this information in a journal. Pocket-sized journals or notepads work best as they are convenient and easy to carry. Alternatively, you can record your thoughts on a tape recorder. Digital recorders and today's smartphones with audio recorder applications are also pocket-sized and easy to use. 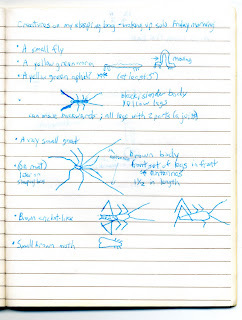 On a camping trip with North Carolina Outward Bound in 1994, I wrote down our activities and my observations in a daily journal that was provided by Outward Bound for such purposes. 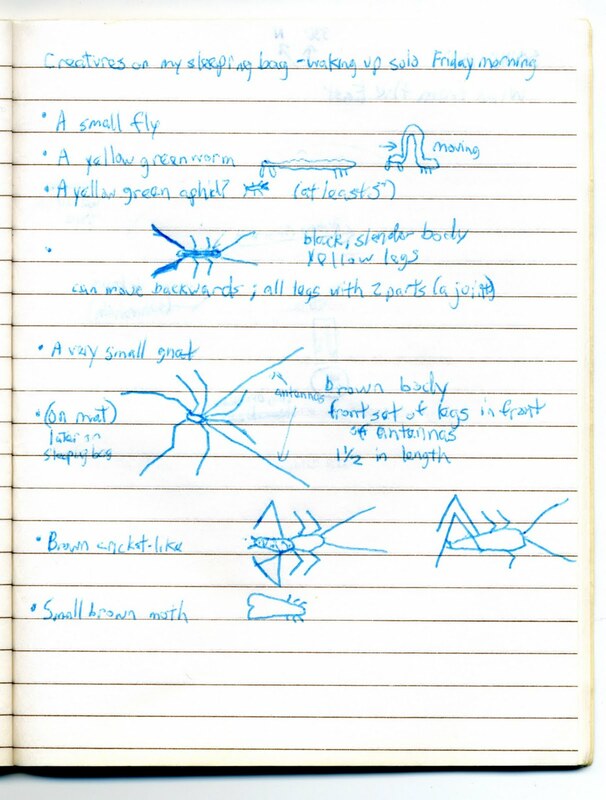 Here is a page in my journal on which I drew the bugs I found on my sleeping bag when I awoke one morning. If you have access to the equipment and internet connectivity, you can take advantage of websites to capture your notes and also make them available for other people to view. A simple travel blog can be created for free using Blogger or Wordpress. There are also websites specifically tailored for travelers to enter their journal entries. Some of the more popular ones are MyTripJournal.com, Travellerspoint.com, Travelblog.org, and Travelpod.com. For this trip in Ireland, our trip leader provided each person with a small journal and pen. I captured information early on in the trip and documented more on the flight back home. Take photos throughout the trip. Taking photos can make you more observant as you look for interesting shots to take. It can serve as a visual journal and reminder of what you have seen. It allows you to share your experience visually with other people when you return from your trip or as you go along. Personally, I take photos during all of my trips as I also consider it a hobby, an artistic endeavor, and an integral part of the trip experience. One caution: Never let photo taking and videotaping become too consuming such that you are focusing on picture-taking and not on being in the moment and enjoying what is around you. Do not become the tourist who sees places only through an LCD screen or viewfinder. For the trip to Ireland, I took photos and a few videos throughout the trip. I prepared three photo albums when I got back home. I then provided links to them to my fellow travelers and my friends. Here is the link to one of the albums I created and made available on Kodak Gallery (please log in with your own username). Extend your trip after you get home. This can be done several ways. Summarize your trip by writing down your key experiences and learnings. Create a scrapbook of your trip. Sort through your photos, create a photo album, share them, and discuss them with your friends. Follow up on a topic that interests you by doing more research on it or by finding opportunities online or in your town where you can experience it more. 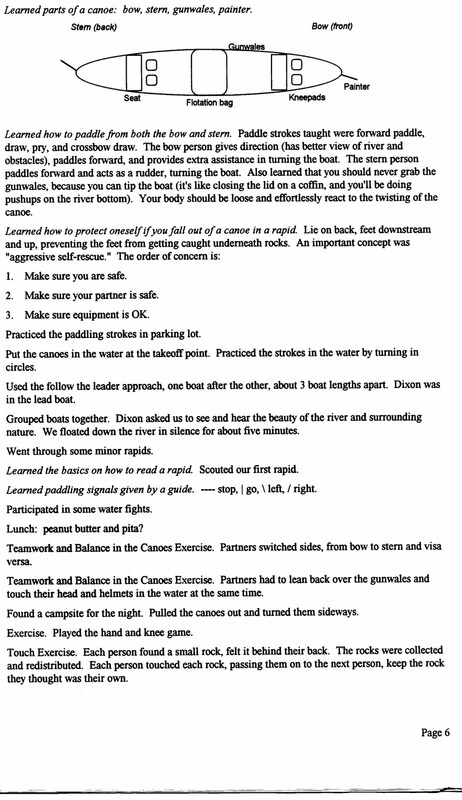 As an example, for the North Carolina Outward Bound trip, I summarized the activities and my key learnings in a document and sent them to my fellow travelers. Here is a copy of one of the pages. For this trip to Ireland, I reviewed my photos, created photo albums, and shared them with my friends. I reread some of the books and websites I had looked at earlier, and I did some additional research on the Great Famine. I wrote down key learnings from the trip. My knowledge about Ireland was very limited prior to preparing for the trip. I have listed below just a few of my own takeways from the trip. Some of the examples I highlight below are contemplative and can contribute to personal growth and wisdom. A few others are more "fun facts" to give a sense of the variety of what you can learn on a trip. Home-grown food could have been made available during Ireland's Great Famine in the mid-1800's. Ireland had major potato crop failures for several years starting in 1845 due to a potato disease called blight. Estimates of crop loss were 33-50% in 1845 and 75% in 1846. Over 3 million Irish were totally dependent on potatoes as their sole source of food. Estimates vary on the impact to the Irish population, but approximately one million people died of starvation or diseases associated with the famine and one million more emigrated from Ireland between 1846 and 1850. There are plenty of historical, economic, social, religious, and political aspects to this unfortunate event. What stuck with me was there was plenty of non-potato crops harvested and livestock raised in Ireland during this time. These crops and livestock were exported because the landlords could get a higher price for them outside of the country. Ireland was a net exporter of food for most of the time between 1845-1849, and one historian claims Irish exports of calves, livestock (except pigs), bacon, and ham actually increased during the famine. There were more people living in Ireland in the 1800’s than there are today. Ireland's Great Famine was a watershed moment. Just prior to the famine, the population in the 1841 census was recorded as 8.2 million. The population decreased by over two million during the famine. Emigration became entrenched in the culture and by 1901, the population of Ireland was down to 4.5 million. It has never reached its peak population of 1841 census. The 2008 population estimate for Ireland is approximately 6.2 million (4.4 million in the Republic of Ireland and 1.8 million in Northern Ireland). The current financial crisis in Ireland is one of many classic cases of "irrational exuberance". The Irish Stock Exchange general index was briefly at 10000 points in April 2007 and is currently around 2956 points in April 2011 (a 70% drop). Housing prices fell significantly, and this article states Ireland's drop in house prices is the worst in the world as of this writing. It was fascinating to read an anecdote in this article on Ireland's financial crisis that many immigrant workers left Ireland during this crisis, some abandoning their cars (purchased with borrowed money) at the short-term parking lot at the airport. Laws were enacted specifically to discriminate against the Roman Catholic majority in Ireland. Henry VIII of England is known for separating the Church of England from the Roman Catholic Church in the 1530's, and with English dominion over Ireland in the 1600's, religious allegiance was used to determine loyalty. The Test Acts of the 1670's used religious tests that effectively barred Roman Catholics and non-conforming Protestants from public employment and sitting as members of the Irish Parliament. Penal laws were enacted in the 1700's in Ireland to deprive certain civil rights, including bans on intermarriage with Protestants, holding firearms or serving in the armed forces, voting, buying land under a lease of more than 31 years, inheriting Protestant land, and owning a horse valued at over 5 British pounds. As a result, many religious people had to practice their faith in secret during these times. Walled gardens serve two purposes. First, the walls protect the plants from the wind. Second, the heat retained in the walls from the sun during the day keeps the temperature of the plants warmer in the cool evenings. The term "proper fry-up" is very appropriate for a traditional Irish breakfast. Almost everything is fried -- eggs, bacon rashers, sausages, puddings, mushrooms, tomatoes, potato farls -- either in Irish butter or bacon fat. 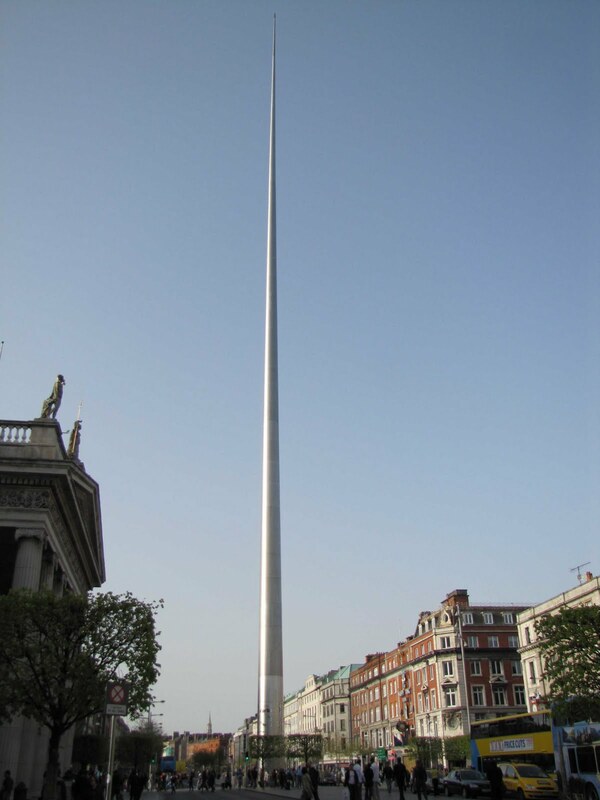 Dublin has one of the world's largest parks (Phoenix Park) and one of the world's tallest sculptures (the Spire of Dublin). The spire has a 3 meter diameter at the base and 15 centimeter diameter at the top. Another great blog post Daniel! Thanks for the great reminders. Ireland is a very soulful place and I'm thrilled that it was a memorable experience for you and Grace.